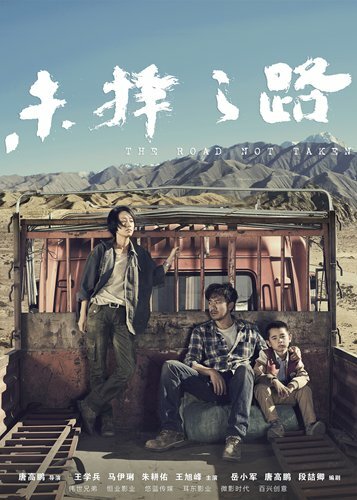 Chinese director Tang Gaopeng's debut movie The Road Not Taken is set to hit Chinese mainland's cinemas on Friday. Starring Wang Xuebing, Ma Yili and Zhu Gengyou, the road film inspired by Robert Frost's 1916 poem of the same name follows three people thrown together by happenstance as they travel their way across West China's vast Gobi Desert. What happens to the trio - Eryong, a man trapped by debt; Xiaomei, a truck driver; and a young kid - during their journey changes their lives. At a media event in Beijing on Thursday, the young director revealed that in order to better present the trip that takes place over three days and two nights in the Gobi Desert, the cast and crew had to endure hot days and cold nights for several weeks of shooting. Since its debut at the Shanghai International Film Festival on June 19 and a number of pre-screening events across the country, the movie has earned a high score of 7.1/10 on media review site Douban.